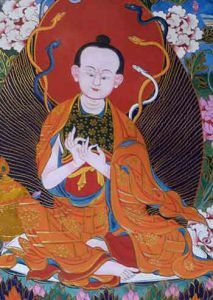 Nagarjuna (Pakpa Ludrup in Tibetan) was a brahmin youth with a brilliant, scholarly intellect and the magical gift of invisibility. However, being bored of scholarly life he sought out a life of sensual pleasure. After breaking into the king’s palace with three friends, he narrowly escaped with his life after being discovered (his friends were not so lucky). Filled with self-disgust he willingly accepted the sentence of exile and set out on a spiritual quest. His travels took him to the Cool Grove Charnel Ground where he was given initiation into the doctrine of the Buddha. 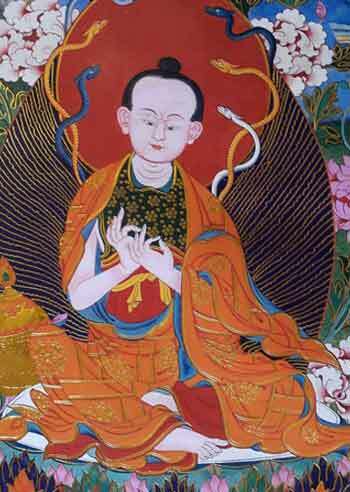 Then he travelled to the famous monastic academy of Sri Nalanda, where he excelled in the arts and sciences. It wasn’t long however before dissatisfaction with mere intellectual study once again arose within him. He began meditating on Tara, and when she appeared to him, he left Nalanda and took up life as a wandering monk. Later he decided to go into retreat in Rajagrha, where he remained for twelve years, sustained by the Twelve Consorts of the Supreme Elemental. After he’d completed all his sadhanas, all 108 Elemental Consorts were under his control. Invigorated with the intention of serving all sentient beings, he attempted to turn Gandhasila Mountain into pure gold. However, he was dissuaded by the bodhisattva Manjushri. After being assisted across a dangerous river by a kind herdsman, Nagarjuna said that in return the man could have anything he desired. The herdsman’s wish to be king was granted and he became King Salabandha. Salabandha’s kingdom prospered and during these happy years, Nagarjuna spread the teaching of the Buddha far and wide. One day the king began to experience omens (caused by an evil spirit) that Nagarjuna’s life was coming to an end. Sure enough, the great god Brahma in the guise of a brahmin came to beg for the master’s head, and when Nagarjuna agreed, out of grief the King laid his own head at his guru’s feet and died. Nagarjuna then took a stalk of kusha grass, beheaded himself and handed his severed head to the brahmin. All things withered, and the virtue and merit of men faded. Eight yaksis, the female Elementals came to stand guard over Nagarjuna’s body, where they are said to remain up until the present day.